A caesarean section, or C-section, is surgery to deliver your baby through a cut the doctor makes in your lower belly and uterus. This cut is also called an incision. In many cases, the doctor makes the cut just above the pubic hairline. In other cases, it runs from the belly button to the pubic hairline. Both cuts leave a scar. It most often fades with time. The surgery may be done while you are awake but your belly is numb. This lets you be awake for the birth of your baby. Less often, women need general anesthesia. This means you are asleep during the surgery. Most women go home about 3 days after the birth. You may feel better each day. But you will likely need about 6 weeks to fully recover. During the first few weeks you will need extra help with household chores. But you will be able to care for your baby. You can do things like breastfeed and change diapers. If you take blood thinners, be sure to talk to your doctor. He or she will tell you if you should stop taking these medicines before your surgery. Make sure that you understand exactly what your doctor wants you to do. Your doctor will tell you which medicines to take or stop before your surgery. You may need to stop taking certain medicines a week or more before surgery, so talk to your doctor as soon as you can. 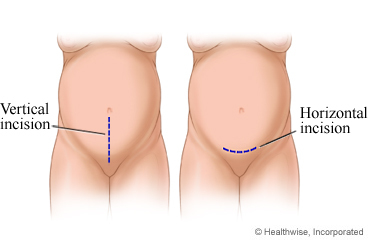 Enter F523 in the search box to learn more about "Caesarean Section: Before Your Surgery".